You could save a life by knowing how to administer Narcan. The rate of opioid overdose deaths has nearly doubled over the last five years in Kenosha County. In 2017, Kenosha County had 57 toxicity deaths. Narcan Nasal Spray is the brand name of naloxone hydrochloride. 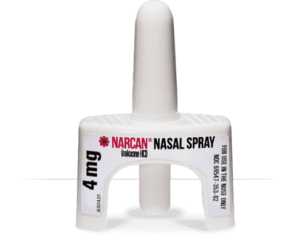 Narcan is the only FDA-approved nasal form of naloxone for emergency treatment of a known or suspected opioid overdose. Learn more about recognizing the signs of an opioid overdose. Why should I know how to use Narcan? Addiction has no stereotype. You could save the life of a friend, relative, co-worker, or a stranger. ​Do you need to be a medical provider to use Narcan? NO! Anyone can learn how to use and give Narcan. Is there legislation that protects those who help overdose victims? Yes! ​Wisconsin has the Good Samaritan Law and 2013 Wisconsin Act 194, which state that anyone who calls for help or drops off someone who is experiencing a drug overdose will not be charged with possession or paraphernalia. ​Limit - the person who overdosed is not covered. Also any other crime committed at the scene is not protected by law. 2013 WI Act 200 covers anyone, regardless of medical background, from being held liable for administering naloxone when they act in good faith believing that the person is experiencing an opioid overdose.